Never complain about a gain. That's what they always tell you after you sell a stock for a small gain, then watch it climb higher and higher and higher. I've done this plenty of times throughout my career. Mostly because I'm just not that big of a gambler. If I can lock in a nice gain in a short amount of time, I consider it a gift, and don't wait around for a bigger gift. Some have suggested this is my downfall, claiming that if I had a bigger set of stones I'd be much wealthier. And perhaps that's true. Certainly this is the case with Starbucks (NASDAQ: SBUX). Back in April of 2013, I scooped up a few shares of SBUX when it dipped below $70. I figured it was a decent price given the fact that my analysis indicated the stock could touch $82 within a year. Certainly nothing wrong with a 17% gain with a small dividend to boost. Well, earlier this year, Starbucks crushed earnings with Q1 same-store sales growth coming in at 5% and average purchase prices rising 3%. 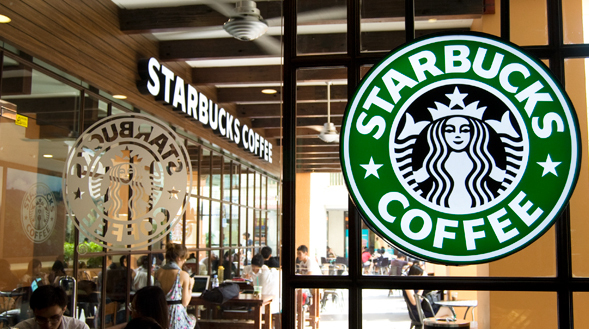 Analysts chimed in that Starbucks was proving its worth as a long-term core holding for investors. On the news and analyst upgrades, the stock surged, hitting a new 52-week high of $94.83 on February 25. As luck would have it, I bugged out at around $86. Deep down, I knew the stock would touch $90, but I didn't trust the broader market. Still don't. But none of that matters. What matters is that instead of walking away with a 28% gain, I walked away with a 22% gain. I know, I know. What's 6%, right? Well, what can I say? Greed breeds unreasonable expectations. Now since the stock hit that new 52-week high, it's adjusted a bit. But long-term, I still like Starbucks. Especially after seeing the company's latest commercial. I'm a big believer in the power of advertising. You get yourself one solid ad campaign, and you're golden. GEICO Insurance is a great example of this. With the help of some incredibly creative ads, GEICO ultimately became the second largest auto insurer in the U.S.
Warren Buffett has actually gone on record stating that if he could, he would spend $2 billion on GEICO ads. Berkshire Hathaway is actually the parent of GEICO, so clearly Buffett's got some skin in this game. In any event, I never doubt the power of a solid marketing campaign. And I think Starbucks landed one when it launched its documentary-style “Meet Me at Starbucks” campaign last October. Boy does this thing sing to the Starbucks customer base. It not only does an excellent job at making them feel all warm and squishy, but I'm pretty sure it helps a lot of people to forget the fact that they're ponying up a lot of scratch for a cup of coffee. Of course, for Starbucks, it's not really about coffee. It's about a lifestyle that the company has successfully created. It's a lifestyle that most Americans embrace, and it's a lifestyle that will continue to make Starbucks a crap ton of money. It's this kind of advertising that's going to help Starbucks become a $100 stock. I don't know when it's going to happen, but I do know that if the broader market gets sideswiped this year and takes Starbucks down with it, I'm going to be ready to pounce. Because I would love another shot at this one on it's way to $100. Add some fizz to your portfolio with a soft drink company! In the last grocery epoch, the neighborhood grocer was crushed by the supermarket. Today, we're in a new age.